In 2004, Dr. Shah and his group created the first microbial database for mass spectrometry, which was instrumental for applying the technique to clinical diagnoses. “Because of the huge diversity among microorganisms, you need to have a database that is very comprehensive to identify variants within a species,” explains Dr. Shah. According to Dr. Shah, clinical microbiology labs have widely adopted MALDI-TOF because of the technique’s simplicity, speed, and accuracy. “Within minutes, you can train staff who have no experience at all to analyze samples,” remarks Dr. Shah. Blood culture samples that previously required overnight incubation can be analyzed within two to three hours, meaning diagnosis and treatment of infections can begin within the same day. The technique does have limitations. “One of the drawbacks of the linear MALDI-TOF technology is that one relies entirely on mass spectral pattern matching, without knowing the exact identity of each mass ion,” observes Dr. Shah. This is problematic for identifying specific strains of bacteria. Dr. Shah says that the answer to this problem lies in adopting tandem mass spectrometry to identify amino acid signatures across strains. According to Dr. Shah, future microbiology applications for mass spectrometry will involve mapping the proteome to identify antibiotic resistance or virulence markers, especially within high-risk pathogens. 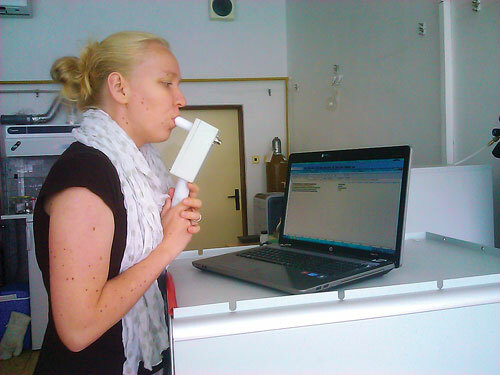 With a new technique called selected ion flow tube mass spectrometry (SIFT-MS), clinicians can acquire quantitative measurements of volatile compounds exhaled by patients in real time. Previous techniques using gas chromatography-mass spectrometry (GC-MS) required that samples be collected and transported to a machine—a process that could take an hour to complete. David Smith, Ph.D., F.R.S., and Patrik Spanel, Ph.D., professors of chemical physics at Keele University, U.K., developed SIFT-MS. “The biggest and most exciting aspect is the detection in the lungs of a bacterium called Pseudomonas aeruginosa, which infects the airways and lungs of these poor people who suffer from this debilitating disease called cystic fibrosis,” informs Dr. Smith. Dr. Smith’s group previously determined that the Pseudomonas aeruginosa bacterium emits the chemical hydrogen cyanide. The group is also using SIFT-MS to identify volatile compounds released by other bacterial and fungal infections as well as tumors in the lungs. Additionally, Dr. Smith and colleagues used SIFT-MS to discover that pentane levels are elevated in the breath of patients with inflammatory bowel disease. Researchers at Keele University have developed SIFT-MS, or selected ion flow tube mass spectrometry, a real-time technique that measures volatile compounds exhaled by patients. SIFT-MS has been used to detect compounds associated with lung cancer, bacterial and fungal infections, and inflammatory bowel disease. “The advantage of mass spectrometry is that it increases the number of chemical entities you can measure in biofluids, like plasma or urine, by two log order fold,” asserts Subramaniam Pennathur, M.D., associate professor of internal medicine and director of molecular phenotyping and metabolomics at the University of Michigan. The group is currently analyzing blood and urine samples that were collected from kidney disease patients 7 to 10 years ago to look for metabolites that correlate with disease progression. The hope is that these metabolites could be used to predict a patient’s outcome and may give insights into disease-causing mechanisms. According to Dr. Pennathur, one limitation of untargeted mass spectrometry is that there is not a single platform that can analyze amino acids, carbohydrates, nucleic acids, alcohols, and lipids. The untargeted technique is also not very quantitative or reproducible. That is why Dr. Pennathur and his team use a combination of approaches—and mass spectrometers—to do their research: quadrupole time-of-flight (Q-TOF) for discovery studies and triple quadrupole and GC-MS for more targeted quantitative work. To begin to answer this question, Dr. Cramer’s group and collaborators used MALDI imaging to search for penile cancer biomarkers. Using the technique, the group was able to identify a specific biomarker, S100A4, that was found in the malignant tissue samples but not in the noncancerous tissue from two penile cancer patients. This was subsequently verified by immunohistochemistry in a large patient cohort. 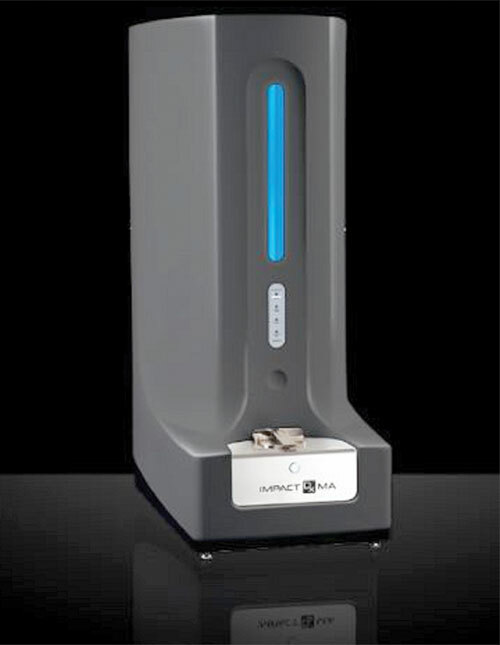 Caprion uses triple quadrupole mass spectrometers for MRM because it allows for the selection of both the parent peptide and specific peptide fragments. “That double selection really reduces the background dramatically. The sensitivity is high,” insists Dr. Chelsky. “The confidence in your peptide ID is very, very high.” Internal reference standards can also be used in this technique, which allows comparison between different analyses. The technique has a wide range of clinical applications, and Caprion has ongoing projects covering all major therapeutic areas—from oncology to CNS diseases to cardiovascular. “The common applications are cleavage sites, protease inhibitors, kinase inhibitors, and simply assessing protein levels,” notes Dr. Chelsky. This technology is not without limitations, however, especially for proteins with low expression levels, such as cytokines. “You can’t see everything; it’s not the answer in all situations,” concedes Dr. Chelsky. Caprion has an additional nontargeted assay that uses Thermo Scientific’s Q-Exactive mass spectrometer for sequencing peptide fragments that can then be compared against a database. “You come up with a very straightforward assessment of thousands of proteins in a single assay,” says Dr. Chelsky. Statistical software and knowledge about protein pathways allow researchers to then focus on a small group of proteins. 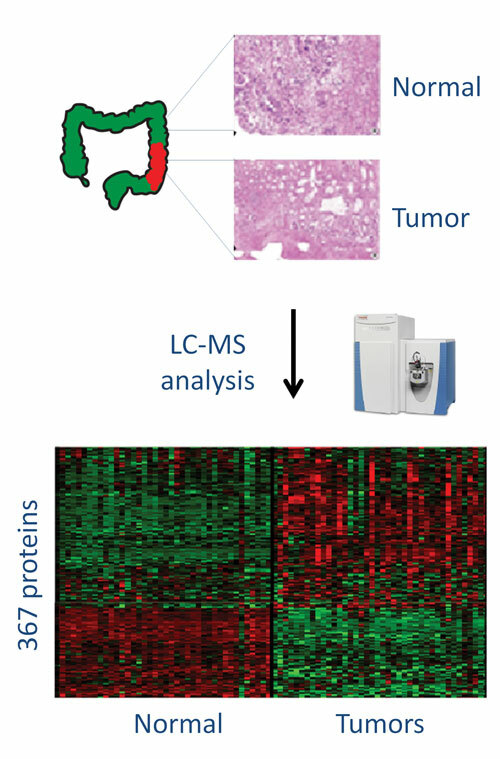 One current application is the identification of colon cancer biomarkers in FFPE sections from tumors and adjacent normal tissue. According to Dr. Chelsky, the ultimate goal is to significantly increase the amount and quality of information available to pathologists, leading to more informed decisions for patient care. Drs. Shah, Smith, Cramer, and Chelsky will be presenting their work at the SelectBIO conference, “Clinical Applications of Mass Spectrometry,” which will be held in Barcelona, Spain on October 29–30. Caprion Proteomics asserts that its multiple reaction monitoring (MRM) assays, which analyze proteins in formalin-fixed paraffin-embedded (FFPE) tissue sections, can readily discriminate between colon tumor and adjacent normal tissue. Forty pairs of patient samples were analyzed, with 2,875 proteins quantified and 367 overexpressed in either tumor or normal tissue sections, creating a clear signature of the tumors. The FDA recently approved Agena Bioscience’s Impact Dx system for the clinical diagnosis of Factor II and Factor V Leiden. Specifically, the genotyping test is indicated for use as an aid in the diagnosis of patients with suspected thrombophilia. Using MALDI-TOF mass spectrometry, the MassARRAY’s underlying technology for the Impact Dx, identifies specific DNA biomarkers with high specificity and sensitivity, according to a company official. Factor II and Factor V mutations are each well-defined single nucleotide polymorphisms, providing a definitive multiplexing proof of concept for the first FDA-approved indication using this technology, he added. “There are other DNA-based platforms already available for Factor II and Factor V genotyping,” explained Rhett Affleck, Ph.D., vp of R&D at Agena. “The test performance is a positive percent agreement of >99.9% and a negative percent agreement of 99.3% for Factor II. Dozens of laboratories are currently running clinical research applications on the MassARRAY platform, said Dr. Affleck. Applications and assays span from heritable diseases like cystic fibrosis to genotyping applications in blood cells, solid tumors and blood cancers, panels for pharmacogenomics and applications in methylation and quantitative gene expression. Agena officials say that developing a new genotyping assay for a research-use-only MassARRAY system takes just a few days.